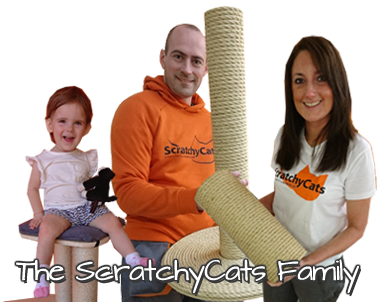 Shipping your handmade cat scratching post to you is about the only thing that we don't do ourselves here at ScratchyCats. Like any other retailer or online shop we have to use a courier company. Unlike other businesses though, we think that honesty is the best policy and don't try to 'pretend' that the postage is FREE by inflating all of our product prices in order to cover our shipping costs. We believe that transparency is key so that you know exactly how much you're paying for the product, and the additional charge for shipping. It's an unfortunate fact of life that courier companies are not free, and neither are boxes and packaging materials. For the majority of our sales, we use DPD who offer a fast, efficient and reliable service to both us (the business) and you (the customer). Winner of the Queen's Award for Enterprise 2015 (in the Innovation category) for its unique one hour delivery service - we're confident that DPD will provide a faultless delivery service. Once your product has been made and is packaged ready for dispatch, you'll receive a dispatch notification email from DPD which includes delivery details. On the day of delivery, you'll receive a one-hour delivery time slot notification email. At any point, you can log into the DPD system from links within the DPD emails and manage the delivery should you need to add some details such as a nominated safe place, or make changes to the delivery including the date or delivery address. The price you pay for shipping depends on what you buy from us and is worked out based on both a weight and volumetric equation, see below for a guide to our shipping prices. This table is for UK Mainland customers only. Those living outside of the UK Mainland should contact us before purchasing for a postage quote. We are happy to use an alternative provider if you wish to specify your preferred courier. All we ask is that you cover any extra costs involved. Please conatct us for details. Our preferred payment method is through Paypal. However, if you don't have a Paypal account and want to pay using an alternative method you have the following options. When you proceed to the basket on the web site, simply select 'pay by debit/credit card' lower the down the page instead of signing into Paypal. Unfortunately we are unable to take card payments over the phone at the moment. Simply print off an order form and fill it out with all the details you'll find on the web site. Send the form to us along with a cheque for the full amount including postage costs. All prices are clearly displayed on the web site but if you have any queries please get in touch. Please make the cheque payable to 'Mr Martin Veale'. If you're local to us you are welcome to call into out workshop (by appointment please) and pay with cash. PLEASE DON'T SEND CASH IN THE POST. Ordering from ScratchyCats is simple. Choose the product you wish to order and follow the step-by-step on screen instructions. If you have any problems ordering, please contact us and we'll do what we can to help. If you've placed an order with us and wish to cancel - please contact us within 24 hours of placing the order. We'll cancel the order and refund your payment. We'll refund the payment right-away, but depending on your bank the refund may take 1-3 days to appear. Orders cancelled after 24 hours may incur a cancellation fee (if we've already made a start on your order), to cover any loses to our business as a direct result of the cancellation. In the event of a problem please contact us in the first instance to discuss options to rectify the issue. See our returns policy for full details regarding returns including all terms and conditions. We believe that our products are exceptional value for money. All our products are handmade in the UK and we only use top quality materials. We work out our prices based on the cost of materials used and the time involved to make each product. Every single one of of products is made from scratch by hand in Devon, England. Nothing is outsourced and we don't import cheap products to sell to you. There are cheaper cat scratching posts on the market, but there are no comparable products on the market at lower prices than you'll find at ScratchyCats. Cheaper alternatives are often poor quality mass produced products made in China. These do not have longevity and cats don't use them. We can't compete with cheap Chinese imports on price, but then they can't compete with us on quality - as with everything in life you get what you pay for. Postage charges are charged at the rate we pay, we don't make any money on postage.